THE royal proclamation issued in 1763 transferred the north 'coast' of the Gulf of St Lawrence, the Atlantic 'coast' of the mainland, Anticosti, and the Magdalen Islands to Newfoundland. It also erected the government of Quebec , and included within the new province a roughly triangular area, bounded on the east by the St John River . This stream falls into the St Lawrence opposite the western extremity of Anticosti , and was almost certainly chosen because of its geographical position, irrespective of its importance as a topographic feature - or the reverse. "And we do further declare it to be our Royal will and pleasure for the present, as aforesaid, to receive under our Sovereignty, protection, and Dominion, for the use of the said Indians, all the lands and territories not included within the limits of our said three new Governments, or within the limits of the territory granted to the Hudson's Bay Company, as also all the lands and territories lying to the westward of the sources of the rivers which fall into the sea from the west and northwest as aforesaid." (a) To Newfoundland : the coast-strip from a point on the north shore of the St Lawrence opposite the west end of Anticosti, to the entrance to Hudson Strait, and also Anticosti and the Magdalen Islands. (b) To Quebec : a triangular area including, in large part, the settled portion of New France . (c) To the crown : all other portions of the mainland north of the St Lawrence, not included in Newfoundland or Quebec . This, therefore, included the northern portion of the present province of Quebec , and the 'hinterland' of the Labrador coast-strip. The commission to General Murray, November 21, 1763 , appointing him 'Captain General and Governor-in-Chief in and over Our Province of Quebec,' and the commission to Sir Guy Carleton, April 12, 1768 , describe the boundaries of Quebec in practically the same language as the proclamation. A petition for the extension of the limits of Quebec was presented to parliament, and in 1774 the Quebec Act (14. Geo. III, cap. 83) was passed by the imperial parliament. "Whereas His Majesty, by His Royal Proclamation, bearing date this seventh day of October, in the third year of His Reign, thought fit to declare the provisions which had been made in respect to certain countries, territories, and islands in America, ceded to His Majesty by the definitive Treaty of Peace, concluded at Paris on the Tenth Day of February, one thousand seven hundred and sixty-three : and whereas, by the arrangements made by the said Royal Proclamation, a very large extent of country, within which there were several colonies and settlements of the subjects of France, who claimed to remain therein under the faith of the said Treaty, was left, without any provision being made for the administration of Civil Government therein ; and certain parts of the Territory of Canada, where sedentary fisheries had been established and carried on by the subjects of France, inhabitants of the said Province of Canada, under grants and concessions from the Government thereof, were annexed to the Government of Newfoundland, and thereby subjected to regulations inconsistent with the nature of such fisheries. (italics added by James White)"
Clause 1 provided for the extension of the boundaries of the province so as to include 'all the territories, islands, and countries in North America, belonging to the Crown of Great Britain, bounded on the south by a line from the Bay of Chaleurs, along the High Lands which divide the rivers that empty themselves into the River St Lawrence from those which fall into the Sea, to a point in forty-five degrees of northern latitude . . . and northward to the southern boundary of the territory granted to the Merchants Adventurers of England, trading to Hudson's Bay.' It thus transferred to Quebec all the territory lying between the described southern boundary of the province and the Hudson 's Bay Company's territories. "And also all such territories, islands, and countries, which have, since the Tenth of February, one thousand seven hundred and sixty-three, been made part of the Government of Newfoundland, be, and they are hereby, during His Majesty's Pleasure, annexed to, and made part and parcel of the Province of Quebec as created and established by the said Royal Proclamation of the Seventh of October, one thousand seven hundred and sixty-three." The declared intent of the Quebec Act was to annex to Quebec 'all the territories, islands' and countries in North America, belonging to the Crown of Great Britain, bounded on the south, by a line from the Bay of Chaleurs' to the mouth of the Ohio, and on the north by the 'southern boundary of the territory granted to the Merchants Adventurers of England trading to Hudson's Bay.' Coupled with this is the clause annexing to Quebec the coast-strip placed under the jurisdiction of Newfoundland by the proclamation of 1763. Obviously, therefore, the Quebec Act included within the bounds of that province all British territory bounded on the south by the defined line between Chaleur Bay and the mouth of the Ohio ; on the west, by the Mississippi ; and, on the north, by the Hudson 's Bay territories. In the chapter respecting the Ontario-Manitoba boundary it was shown that investigation has practically demonstrated that 'Hudson's Bay' in this order-in-council means the Hudson's Bay Company's territories. Having demonstrated that Lower Canada, by the order-in-council of 1791, included the whole of the mainland east of Upper Canada and lying north of the River and Gulf of St Lawrence, and east and south of the Hudson's Bay Company's territories, the only indeterminate factors are the limits of the latter. 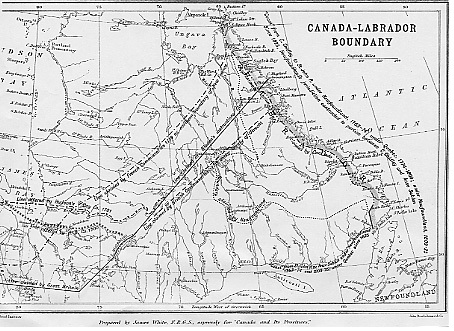 The decision of the imperial Privy Council in the Ontario-Manitoba Boundary case fixes the southern boundary on the west side of James Bay at the Albany River, presumably on the ground that the company's offer in 1700 and 1701 to accept it definitely determined their territorial limits in that quarter. It is a fair inference that their offer in 1701 to accept the Eastmain River as their boundary on the east shore had a similar effect. As their offer explicitly states that the French should be forbidden to pass the river, it indicates this stream as the boundary from mouth to source. On the Labrador coast they offered to accept Grimington Island as the boundary. If the English contention be adopted, all the territory to the east and south of a line from Grimington to the source of the Eastmain was part of New France ; if the French contention be adopted, New France included the territory to the south-east of a line from Cape Chidley to a point half-way between the French post at Lake Nemiskau and Fort Rupert. That the line Commissary Bladen was in 1719 instructed to claim is practically identical with the Hudson 's Bay Company's line from Grimington to the Eastmain is a curious coincidence. Whether the boundary-line be drawn from Chidley toward the Nemiskau-Rupert line, or from Grimington to Mistassini is of little importance, as the intervening territory falls to Quebec either as having been part of New France or as part of the Hudson's Bay Company's territories. Having shown that the Quebec of the Quebec Act extended to, at least, the Grimington-Mistassini line, it only remains to consider the effect of subsequent legislation by the imperial government. "And to the end that the open and free fishery of our subjects may be extended to and carried on upon the Coast of Labrador and the adjacent Islands, We have thought fit, with the advice of our said Privy Council, to put all that coast, from the River St John's to Hudson's Streights, together with the Islands of Anticosti and Madelaine, and all other smaller Islands lying upon the said coast, under the care and Inspection of our Governor of Newfoundland." When, by the proclamation of 1763, the north shore of the Gulf of St Lawrence was subjected to the operation of English law and custom, the French-Canadian fishermen complained ; and, similarly, the Newfoundland fishermen also complained when the Gulf and Atlantic coasts were, in 1774, placed under the jurisdiction of Quebec . The act of 1774 transferred to Quebec 'all such territories ' which had, since February 10, 1763, 'been made part of the Government of Newfoundland.' The preamble recites that whereas 'certain parts of the territory of Canada, where sedentary fisheries had been established and carried on by the subjects of France, inhabitants of the said Province of Canada,' etc. Judicature Act, 1821. - Act 1-2 Geo. IV, cap. 66, 1821, extended and confirmed the act of 1803. It specifically extended the jurisdiction to the Hudson's Bay Company's territories also. Judicature Act, 1824. - Act 5 Geo. IV, cap. 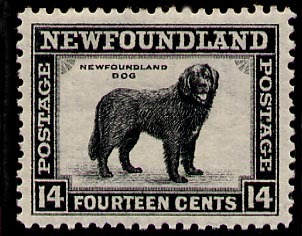 67, 1824, empowered the Governor of Newfoundland to institute a court of civil jurisdiction at any such parts or places on the coast of Labrador as have been re-annexed to Newfoundland . An imperial act (3-4 Vict. cap. 35), 1840, reunited the provinces of Upper Canada and Lower Canada. The Rupert's Land Act (31-32 Vict. cap. 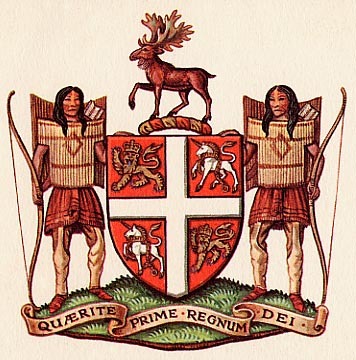 106), 1868, empowered the surrender of the lands, privileges and rights of the Hudson's Bay Company, and an imperial order-in-council, June 23, 1870, provided for the admission into the Dominion of Canada of Rupert's Land and the North-western Territory. "whereas it is expedient that all British territories and possessions in North America, and the islands adjacent to such territories and possessions, which are not already included in the Dominion of Canada, should (with the exception of the colony of Newfoundland and its dependencies) be annexed to and form part of the said Dominion." Differences having arisen between the Dominion and the Province of Quebec respecting the northern boundary of the latter, a Dominion Act (61 Vict. cap. 3) was passed in 1898, defining the boundary as the Eastmain River from the mouth to its source ; thence due east to the Ashuanipi River; thence downstream through said river and the Hamilton River to the western boundary of Labrador. "Mistassins, and behind the Mistassins as far as the Hudson's Bay ; and on the lower part of the river the domain will be bounded . . . by Cape Cormorans as far as the height-of-land, in which extent will be comprised the river Moisey, the Lake of the Kichestigaux, the Lake of the Naskapis, and other rivers and lakes which discharge therein." In 1733 Hocquart granted to Pierre Carlier the exclusive trade, hunting and fishing from Isle aux Coudres to a point two leagues below Seven Islands and 'in the posts of Mistasinnoc, Naskapis,' etc., and the places dependent on them. In 1702 Vaudreuil conceded to Legardeur de Courte­manche the privilege of trading and fishing on the coast between Kegashka and Hamilton Rivers . Courtemanche constructed, at the present Bradore Bay, a post called Fort Phelypeaux. These privileges were exercised by him and by his son-in-law Brouague till after 1759. In 1770 the Moravians established their first mission on the Atlantic coast of Labrador . When, in 1777, the first English settlers arrived at Hamilton Inlet, they found traces of abandoned French settlements. The Hudson's Bay Company established Fort Chimo in Northern Ungava in 1827, and the Erlandson Lake post in 1838. Their first post on Hamilton Inlet was established in 1837, and Fort Nascopee on Lake Petitsikapau - an expansion of Hamilton River - in 1840. (1) From 1763 to 1774 Quebec included the whole of Ungava Peninsula except the Hudson's Bay Company's territories, and a strip of coast from St John River to Cape Chidley . (2) From 1774 to 1809 Quebec included the whole of the peninsula except the Hudson's Bay Company's territories, and in 1803 and in 1821 the jurisdiction of the courts of Lower Canada was extended to these territories also. (3) From 1809 to 1825 the coast-strip from St John River to Cape Chidley was again under the jurisdiction of Newfoundland . (4) Since 1825 the coast-strip between St John River and Ance Sablon has been under Lower Canada ( Quebec ). (5) The proclamation of 1763 explicitly states that the 'coast' was placed under the governor of Newfoundland 'to the end that the open and free fishery may be extended and carried on upon the coast of Labrador and the adjacent islands.' The act of 1774 transferred 'to Quebec, specifically, the territory that had been placed under Newfoundland in 1763, and stated that it formed part 'of the territory of Canada where sedentary fisheries' had been carried on by the French prior to the Conquest. The act of 1809 retransfers the same coast-strip to Newfoundland , and the act of 1825 re-annexes a portion of it to Lower Canada. There is the same continuity throughout, demonstrating that the strip annexed to Quebec in 1825 had the same depth - whatever it may be - as the original strip of 1763. (6) It is obvious that this strip must have been sufficiently wide for the administration of justice, so far as it affected the fishermen - and no wider. (7) As the government of Newfoundland did not protest the boundaries of Quebec, as defined in the Dominion act of 1898, they are estopped from claiming the territory included therein. (8) Newfoundland has laid claim to the portion of Ungava Peninsula that drains into the Atlantic and Strait of Belleisle through her Labrador coast-strip, though it is difficult to conceive that such an extensive claim rests upon a substantial basis. By virtue of this act the dispute can be referred to the imperial Privy Council for decision. It should be so referred, and the differences then adjusted, at an early date. Source : James WHITE, "Labrador-Canada Boundary", in Adam SHORTT and Arthur G. DOUGHTY, eds., Canada and Its Provinces, Vol. VIII, Toronto, Glasgow, Brook Company, 1914, pp. 908-917.